It's that time of year when one becomes a year older, and hopefully a little wiser. As usual I had a great time with friends and family, celebrating with good food and wine. I thought I would just show you a few photos of what was available. 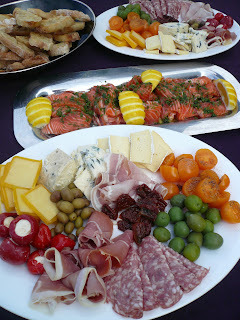 As you can see we started with Antipasti. Items of note would be the orange tomatoes, Sicilian olives, cream cheese stuffed baby capsicums and the central plate of cured salmon. I want to share the salmon recipe with you because it is an easy one and one I use at Bosco Verde Epsom in the antipasto and bruscetta entree. Remove the bones from the fillet. run your fingers along the fillet and remove with chefs tweezers, or cut out with knife if you don't mind a little wastage. Take a suitable tray or plate and sprinkle half the salt on the bottom, lay the salmon on top and sprinkle the remaining salt on top. Cover and refrigerate overnight. Wash the Salmon under cold water and dry on a paper towel. Add the rest of the ingredients on top of the salmon, cover and keep in the fridge until needed. Serve with lemon wedges and grilled Ciabatta bread. 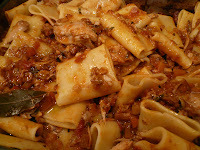 After the above we had my Rabbit ragout served with Schiaffoni pasta, which is a large tubular variety. Having friends in the wine importing business is a real bonus because you get to try wines that haven't been released on the local market, so when Carlo from Sapori d'Italia knew I was cooking rabbit he brought along a bottle of IL Conte Villa, Lu Kont, Montepulciano 2007, from the Marche region of Italy. This wine was amazing, full bodied and has spent 15 months in oak barriques, 12 months in cement tanks and finally 6 months in the bottle before distribution. It was unlike any Montepulciano I have ever tried and at 15% alc. 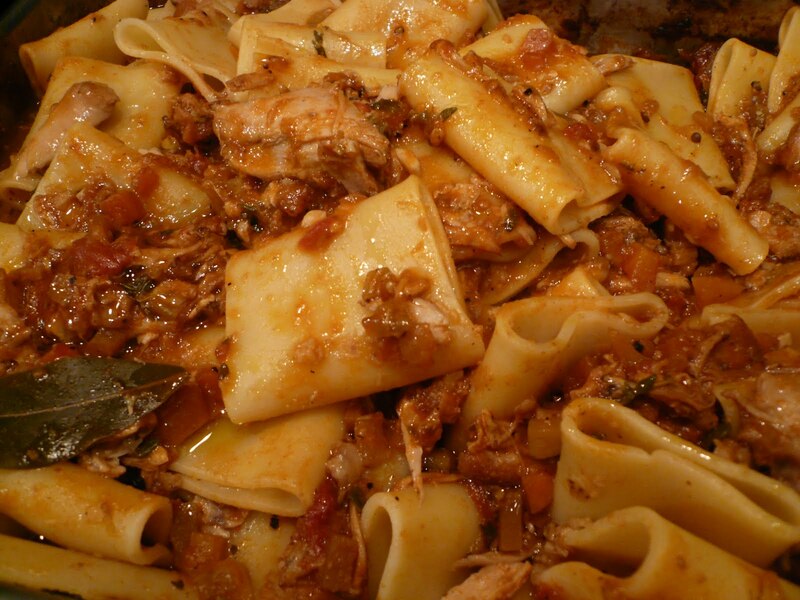 was very robust and a perfect paring with the rabbit ragout. 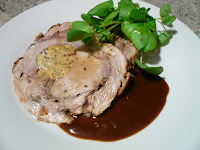 To follow I served a boned pork loin, with belly attached, stuffed with sage and onion omelette, rolled, roasted and served with a doubonet jus. To conclude, I made a toffee almond topped orange cake, which I have made on 3 occasions, and turns out perfectly every time.It really is a great recipe, relatively easy to make. Chef Jules Panna Cotta recipe is a very easy dessert to make, and one which will impress your guests. Panna Cotta, translates to "cooked cream" from Piemonte, Italy, where the dessert is thought to have originated from. 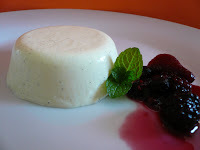 Traditionally, Panna Cotta is a rich, velvety vanilla cream which has been cooked and lightly set using gelatin. I have created this panna cotta recipe, because the cardamom and mint combination work really well together. For those of you who aren't sure of what cardamom is (also spelt cardamon), it is a spice, related to the ginger family, derived from a plant in which the dried pods containing the seeds, also known as "seeds of paradise" are used in a variety of ways from perfume in ancient Greek and Roman times, to an exotic and pungent additive in Asian, Middle Eastern and Central American cuisine. Cardamom is also used to flavour tea, coffee and several liqueurs. 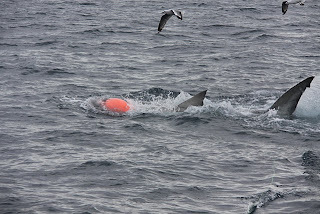 The pods vary in size and colour from white/green to reddish-brown. To make the panna cotta recipe, put the gelatin in a cup, pour over boiling water and stir with a teaspoon. I usually put it in the microwave for a few seconds to make it hot again and to ensure the gelatin is fully disolved. Take a saucepan, add the rest of the ingredients and very slowly bring to the boil. Now add the gelatin mixture and gently simmer for 5 minutes. Remove the vanilla pods, strain the mixture into a bowl. Scrape the inside from the vanilla and add to the bowl. Cool in the fridge, stirring occasionally until slightly thickened. Lightly oil the ramekins and pour the panna cotta mixture into them. Allow to set for a few hours or over night in the fridge, covered. When making panna cotta, the idea is to use as little gelatin as possible to ensure a lightly set dessert. 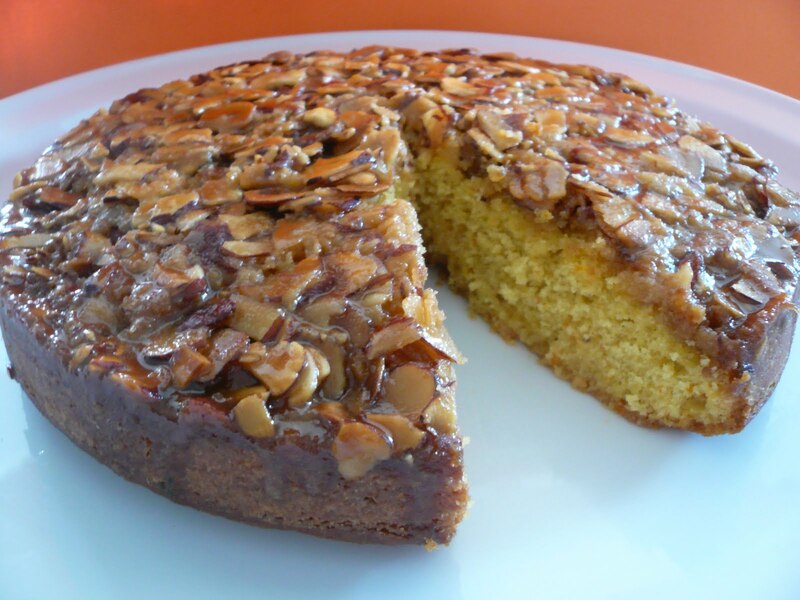 I have experimented to acheive this with the above recipe. It would pay to measure the gelatin with digital scales, to be exact. You are only limited by your imagination when deciding on the flavour of your panna cotta. If you think of fruit, or the many different teas, i.e green tea, raspberry. Even coffee, chocolate flavoured. Or you could simply make a plain vanilla pannacotta, and have a fruit compote of your choice, on the plate to accompany the dessert. Do not allow the panna cotta to set too much in the bowl when cooling down in the fridge. That's all for now, I hope you try Chef Jules easy pannacotta recipe. Chef Jules Is Back Along With Summer! Chef Jules is back, and I want to wish everyone a Merry Christmas, and Happy Holidays. A lot has happened since my last posting. 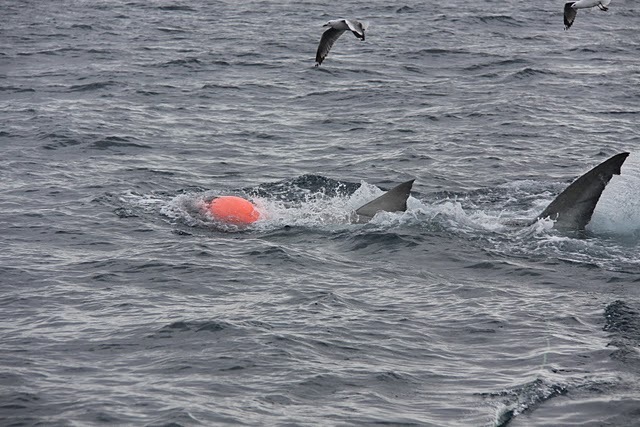 A trip to the Chatham Islands, to see my friend Val Croon of Hotel Chathams, and sample the unique landscape, culture and of course the local produce. Being a seafood lover, it was nirvana for me, abundant crayfish, Paua (Abalone), Blue Cod, Kina (sea eggs) and much more! I will talk more about the trip in the future, but suffice to say it was quite an experience, made great by Val's hospitality.It's always great to get back to Bosco Verde Epsom and try out some new recipes with things you learn along the way. 10 minutes before I jumped in the cage. I made numerous dishes from the Chatham Island produce, just a couple are below. 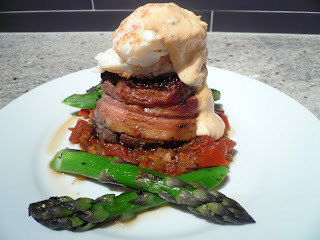 Firstly there is an eye fillet tournedo, wrapped in bacon on a bed of tomato, fennel compote and topped with Chatham Island crayfish/rock lobster tail and drizzled with hollandaise sauce. 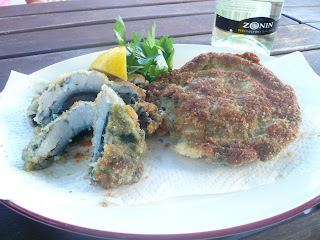 Below that, I have breaded Abalone, simply served with lemon and Pinot Grigio. We are in the middle of the duck hunting season in this part of the world, (May to June). In New Zealand we have more than 20 species of game birds, introduced by our European settlers. Mallard ducks and the Canada Geese do particularly well and are well established. Bearing this in mind I have one of my favourite Duck recipes for you. I could pretend that I shot them, but I confess that the Ducks were procured, minus the buckshot, from my Asian butcher,from whom I also buy a few other products for Bosco Verde Restaurant Epsom. Duck is suited to either long, slow cooking or fast and served medium rare, rather like calamari, and what I like about this recipe is that everything is utilised, even the duck fat! Chef Jules following duck recipe is for 8 people. Wash and pat the ducks dry, season and stuff each cavity with the mirepoix. Take a pot large enough to to fit both ducks, side by side and add water to just below the top of the ducks. Add the bay leaves, pickling spice, salt and parsley stalks. Bring to the boil, cover with the lid and simmer for 1 hour, turn the ducks over, add the soy sauce and orange juice and continue simmering for another hour, take off the heat and leave to cool in the liquid. Take out the ducks, remove the carcass, lay flat, cover and refrigerate. Place pot with the stock back on the stove and reduce by half, strain and refrigerate overnight. Preheat fan grill oven to 180 deg celcius. Remove the fat from the stock and keep to one side. place the stock in a small saucepan and reduce by half, add the mandarin segments and cointreau and reduce to a sauce consistency. Take a roasting tray and put 1 ladle spoon of the stock on the bottom and place the duck on top, season, drizzle with a little olive oil and reheat for 30 minutes, making sure the skin is crispy. Reheat the sauce and finish with a knob of butter, stirring off the heat until incorporated. Portion the duck as required and pour over the sauce. I served the duck with vichy carrots, fondant potatoes, sauteed, just to colour using 1 tablespoon of the duck fat, and baked, using 1/3 duck stock. Some garlic flat beans also accompanied the meal. I finished the meal with Pears stuffed with dried fruit, walnuts, aged cheddar and baked with apple cider, fantastic! I did change the recipe slightly by substituting the aged cheddar for blue castello cheese in the stuffing, and using the aged cheddar for the cut top of the pear, melting part at the end. This is a very easy recipe as it's broken into 2 stages, just takes a bit of planning. Normally, I would use fresh oranges, but to make this recipe easy for you, I suggest using tinned mandarins. I prefer to have the sauce naturally thickened by reducing the stock, rather than using a starch product, may appear thin for some, however more flavoursome. With the duck I served a lovely New Zealand Pinot Noir, Craggy Range, Central Otago 2008. For the baked pear, Rose Tree Cottage, Noble Riesling 2007, from Malborough which worked very well with the dried fruits present in the recipe and wasn't overly sweet, with a nice citrus blossom bouquet. Hope you all enjoy the recipes. I had an invite to a very special 85th birthday party luncheon the other day, held at Bracu restaurant. The restaurant, a Kauri Villa, renovated in 2005, by Ivan and Branka Simunovich, is located in 43 Main Road Bombay, rural south Auckland. With over 40.000 olive trees on the estate it is the largest privately owned olive grove in New Zealand, and makes for a very pleasant vista whilst dinning. The name "Bracu" is derived from the Adriatic Island of Brac, and is the third largest, (48km long, 14km wide) in the Croatian group of Islands, and is where the owners originate. Grilled Fillet of Snapper with roast garlic, chorizo, white bean, steamed clams, pea cassoulet and olive tapenade. I chose the Snapper dish, which read very well, the ingredients, individually, are favourites of mine and together work very well and was cooked to perfection. I also sampled the duck which tasted very good but was let down by not being crispy enough. The main courses were served with Bracu garden salad, Banyuls dressing and Sumac, rosemary fried potatoes. Overall the meals were great, the setting fabulous and the service very attentive without being obtrusive. The wines, which I had tried before, didn't disappoint. 2008 Cable Bay Merlot Malbec Rose from Waiheke Island and 2008 Atarangi Pinot Noir, "Crimson" from Martinborough. Prices are $55 and $68 respectively. We all finished with a special birthday cake for this very special occasion. Chocolate cake layered with berry mousse served with gelato and fresh berries, which was very nice and reminded me to update my chocolate mousse recipe at Bosco Verde Restaurant Epsom. The 2 course luncheon menu is $65 and the 3 course is $75. The olive oils I purchased were natural extra virgin olive oil and lemon infused extra virgin olive oil, both 250ml and $13.75, $15.40 respectively. Both oils are extremely well priced considering the quality. Looking at the dinner menu, you will find entrees around $20 and mains averaging $36 with side dishes i.e. potatoes, vegetables $7.50 each. A special thanks to Jenny, Peter and the birthday girl, Mini for a great day. I want to share one of favourite veal recipes with you, it's really easy and quick if you have all the ingredients at your disposal. Infact it's so quick to prepare and cook that I often have it as a late night meal. Vitello Tonnato, or veal with tuna, is a great combination, and this is Chef Jules a la carte version of this popular recipe, and one which I occasionally serve at Bosco Verde Restaurant Epsom. Traditionally Vitello Tonnato is served cold, using a different cut of veal to that used in my recipe, and a mayonnaise based sauce. When talking of Veal, different names are given related to the age and what the animal was fed, and can become confusing for some. Basically Veal is produced from very young cattle, mostly male calves and the meat should be very pale, finely textured and lean. The fact that the animal has never had the chance to frolic in green pastures and taste the green grass, and often as a consequence, is confined to a small space, has surrounded the veal farming industry with controversy from animal welfare and animal rights activists. For my views on animal welfare and sustainability, check out my "Food For Thought" posting. A few names you may come across when searching for veal include, Non-formula-fed veal, Red or Grain-fed veal, Rose veal or Free-raised veal and shouldn't be confused or passed off as white veal. For myself, veal only deserves to be called veal if the calf is under 30 kilos and approximately 2 weeks old when slaughtered and has had a diet consisting of entirely milk or milk products. This veal is known as Bobby Veal or White Veal. In a large frypan, add the oil, butter and heat until foaming. Place the flour in a tray and coat both sides of the veal, shake off excess and place in the pan, season and cook 2 minutes per side, turning once. Remove from the pan and keep to one side. Add the garlic, caperberries, cook for 1 minute, add the wine and reduce, then the mustard and cream. Reduce a little and place the tuna in to poach, 1 minute per side. Finally put the veal back in the pan to heat through and reduce to a sauce consistency. On the plates, place the veal, then the tuna and spoon over the sauce. Sprinkle with the parsley and top each slice with 1 teaspoon of the salmon caviar. Bluff Oysters are one of Chef Jules favourites and one of natures little gems. Bluff Oysters latin name is Tiostrea Chilensis, is a bivalve mollusc and is of the Ostreidae family. Other names include; Mud Oyster, Dredge Oyster, Foveaux Strait Oyster, Flat Oyster and Deep Water Oyster. Common to Chile and New Zealand, Bluff Oysters have a firm flesh, creamy luscious texture, medium oil content, with a delicate crisp taste of the sea, and for that reason, is one that I recommend if one is a little unsure of oysters or never tried them before. I have prepared and sampled Bluff Oysters many different ways at Bosco Verde Espom, but the best way is "au naturale", i.e, freshly shucked, lemon wedge and accompanied by a glass of Champagne, Chablis or Sauvignon Blanc, although my preference is still a creamy, buttery Australian Chardonnay. Oystering began at Stewart Island in the 1860's and shifted to the cooler, deep waters of Bluff where they are dredged by the oyster fleet at a depth of approximately 60 metres. It is not uncommon for each vessel to have 60 sacks of Bluff Oysters on return to port, each sack containing 800 oysters, each oyster having a minimum length of 57mm. Sometimes helicopters are used to expedite the delivery process, so that seafood markets and up-market Auckland restaurants can have them on the dining table, as soon as the season begins, (March to June). With past problems concerning the oyster parasite, Bonamia Exitosa, resulting in disruptions of supply from 1985-93 and again in 2000-05, the authorities and fishermen recognise the importance of seasonal quotas and at time of writing is 7.5 million oysters. Apparently Bonamia is still present in certain areas, but stocks are growing well and it is hoped the cooler water temperatures will discourage the disease from spreading further. I had some last night and they were exquisite, and worth every penny! Retail prices for 1 dozen are around, NZ $22 in the South Island and up to $30 in the North Island. If you are sampling them in an Auckland restaurant expect to pay $25 for half a dozen and $50 for 1 dozen. The anticipation and excitement at the start of each season is further encouraged by the Bluff Oyster and Food Festival. Started in 1991, it is truly a celebration of this magnificient mollusc and other food from the region, wine stalls and entertainment. Tickets are purchased 9 months in advance for this popular event. Along with the best pizza epsom at Bosco Verde,I have added this great crusted baked Hapuka recipe with braised bok choy to the menu. Labels: bluff oyster, bluff oyster and food festival, bluff oysters, bonamia exitosa, Bosco Verde Epsom, chablis, chardonnay, chef jules, hapuka recipe, oyster, oystering, oysters, pizza epsom. Chef Jules was born in Australia and spent his early years in Surfers Paradise, Queensland. He left there in 1970 and now resides in Auckland New Zealand. Chef Jules has owned many restaurants, from the age of 25. "I have been in the hospitality industry for over 30 years, London City and Guilds trained and still working in the industry. My Blogs aim is to share my thoughts associated with the industry, people, products, likes, dislikes and throw in some restaurant reviews. 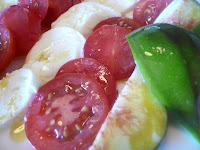 Italian food is my passion, and I have hundreds of my favourite recipes in my head, which I will share with you. I will assume that you have a basic knowledge of cooking, but if more detail is required I can be emailed and welcome all feedback"